Since starting The Scout Project, I’ve been so inspired by the creative people I’ve met or whose work I've come across. One of those people is Sara Barnes, the artist and blogger behind Brown Paper Bag. (One of her cut paper and embroidery works is above.) Sara and I both live in Baltimore, and after meeting for coffee she suggested we collaborate on a series. Our plan is to go into artists' studios armed with our cameras. 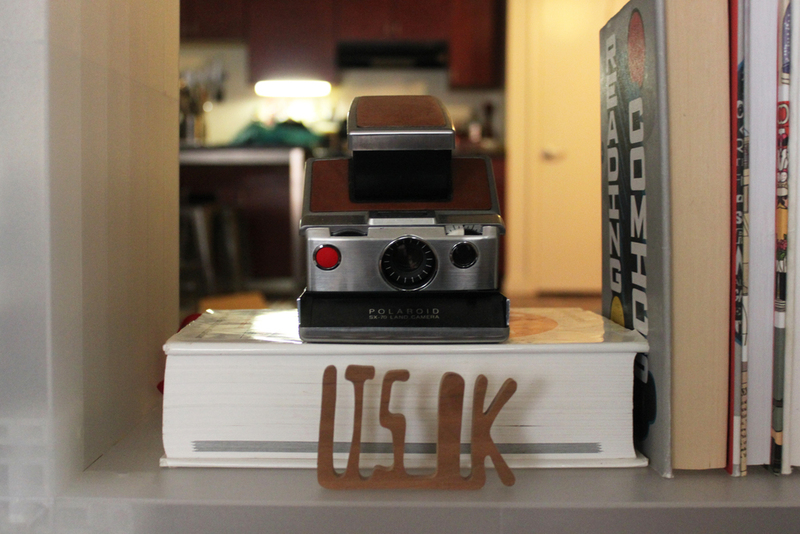 We'll try to capture parts of their creative process and photograph some of the objects they choose to surround themselves with. We're hoping to share some inspiring work, ideas, and tips. To kick off the series, Sara and I are taking a look into each other’s homes. 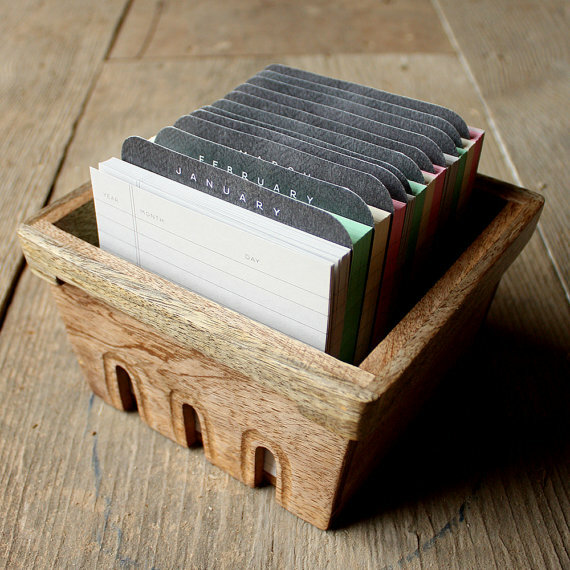 Check out Brown Paper Bag for a peek into my workspace and hear from Sara below. 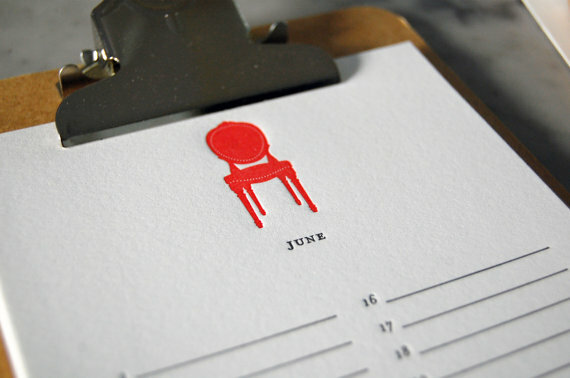 Brown Paper Bag was founded in 2010, originally as just a way to catalog neat artwork and connect with artists around the world. After completing graduate school for illustration in 2013, I shifted the focus to an illustration-centric blog. Now, I feature editorial illustration, illustrated products, tattoos, ceramics, and embroidery. I also interview small-press magazines and zines from time to time. I primarily work out of my apartment. Although I've entertained the thought of an out-of-home studio space for the past couple of years, I ultimately enjoy being close to my kitchen and bedroom. The ceramic lady (face) is by Tuesday Bassen. My apartment is a loft-style unit on the top floor of an old building that now has a 7-11 on its first floor. I share the apartment with my boyfriend, Chris, and our main complaint is the lack of storage space. Nearly everything we own is visible at all times! Our living room, kitchen, and respective workspaces are all within one large room. The decor is a mixture of black/chrome IKEA, Design Within Reach, and CB2, in addition to some antiques that are sprinkled throughout. We've visually divided the living room with two sets of cubed bookshelves, which is where I keep my art books, graphic novels, cookbooks, plants, and small toys. It's something that I refer to often and am constantly fiddling with. Chris has his own matching bookshelf (which I have totally encroached on because I have way more books than him) that mirrors mine. I pick up a lot of ceramics each year at MICA's Art Market. When you buy from the ceramics table, you aren't told any of the names of the artists! So, the geometric shapes I have and the white swan are both unknown artists (to me). The tall, smiley fellow that is on the tiger plate is my newest acquisition by Il Sung Na, a MICA grad student. The bizarre head wearing the baseball cap is by Karin Hagen. The workspace is something we call Mega Desk, which is basically two dining tables pushed together. My side of it is often cluttered with things stacked on top of each other to conserve space and to minimize how messy it is. I have my laptop, weekly to-do list (by Rifle Paper Co.), a pair of colorful headphones, and a mixture of artwork, inspiration, and raw art materials. Oh, and a lot of pens. My desk is certainly cozy, but I enjoy that aspect. It feels intimate and forces me to clean up! I've had other work spaces that were larger and they were a disaster. 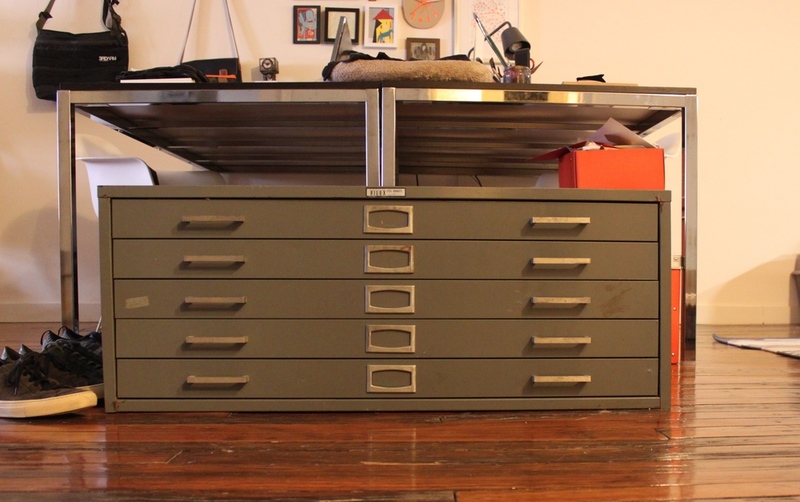 Next to Mega Desk is a flat file, which I got for $40 off Craigslist 3 years ago. I drove for 2 hours each way to retrieve it, and it almost didn't fit in my car once I got there. I'm so happy it worked out, because I love it! The guy who originally owned was a coroner and stored photos of dead people in it. The hand with the eye on the palm is by Sarah Burwash. I love illustrators who make their own ceramics - Tuesday, Sarah, and Karin make things in 2D and 3D. 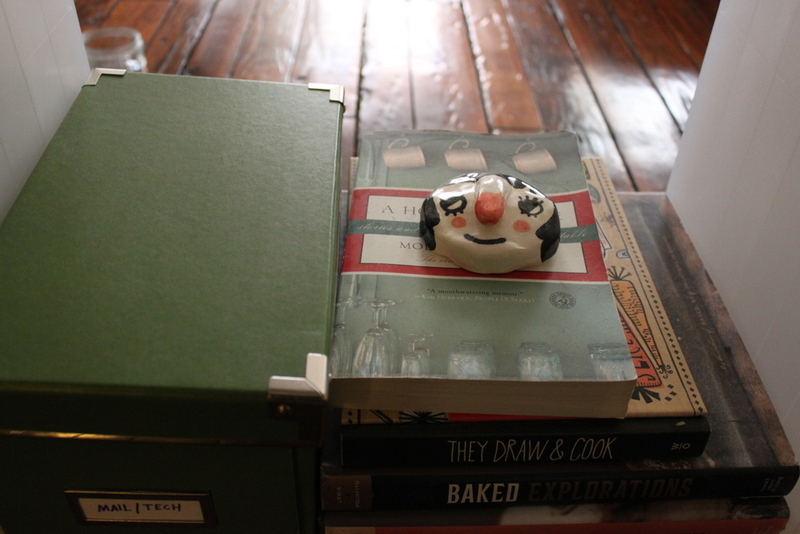 My goal is to amass a collection of small, limited edition ceramics—the more bizarre the better. Through Brown Paper Bag, I've planned projects like the Collage Scrap Exchange, which is a global paper swap. Artists are paired up and mail each other their unique scraps, and each creative makes something that's a combination of both their materials. 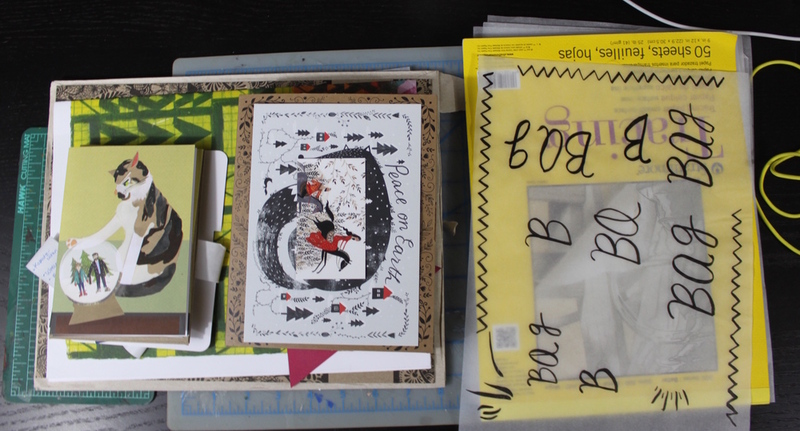 Nearly all of my collage scraps are contained within these three orange boxes. I try to separate the smaller ones between warm and cool colors while the big box is a mish-mash of larger pieces. Digging through each of them is fun—I never know what I'm going to uncover! Today the U.S. National Parks are celebrating their 98th birthday. While I personally wish I could spend some more time in the parks (don't we all? ), for now I'll have to settle with some reminders of "America's Best Idea." 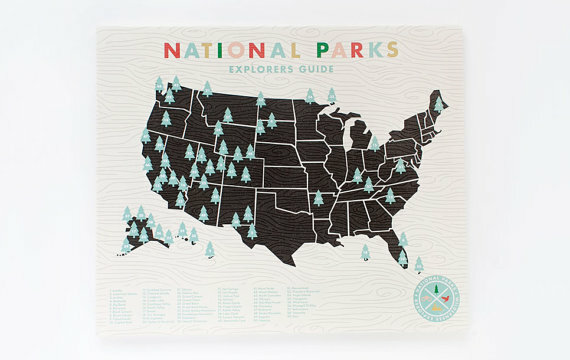 (above) This print comes with a sheet of gold tree stickers so you can keep track of all the national parks you've visited (Ello There/$135). Between 1936 and 1943, the Works Projects Administration (WPA) produced around 2,000 posters, many of which featured national parks. 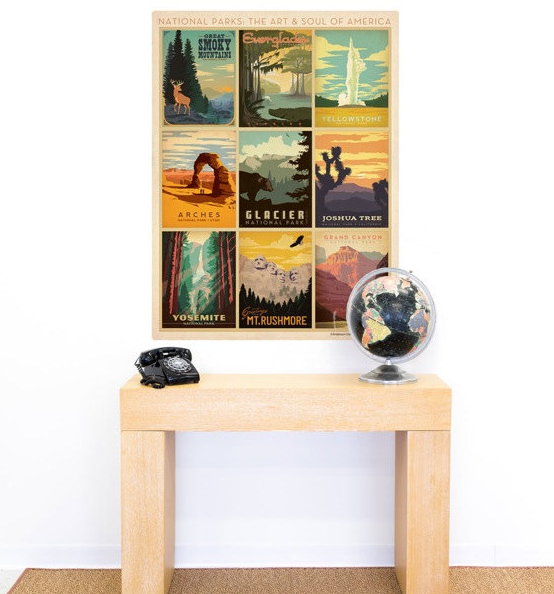 You can browse these posters in the Library of Congress or jumpstart your personal collection with these reproductions (Retro Planet USA/$10). Yellowstone was established in 1872, and is widely held as the first national park in the world. This rustic sign could be a beautiful everyday reminder of the park for your home (Salvage Sign Co./$175). While there are tons of images of the famous Delicate Arch in Arches National Park, I've never seen anything like this sewn postcard (Sew Upscale/$20). This greeting card makes me want to go on a road trip to Big Bend National Park (Misha Aston/$3.20). Cheer on the Grand Canyon with this vintage pennant (Kitschy Vintage/$15). Your collection won't be complete without some vintage black-and-white landscapes by photographer and environmentalist Ansel Adams (marvbin1/$15). A beautiful minimalist print of Two Medicine Lake in Glacier National Park (Jazzberry Blue/$22). Of course, you can also create you own projects with this national park-inspired vector art (Lemonade Pixel/$4).